Pushkar is one of the enchanting places in the royal state of Rajasthan where traditions meet beauty on the golden sand. It portrays vivid images of the rich culture and the benevolent face of this mesmerizing state. Spotlight of an Indian desert holiday, Pushkar Fair is much more than the colourful display of Rajasthan's rural lifestyle, attires, performance arts, and handicrafts. 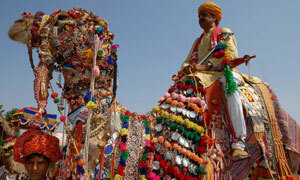 The Cattle and Camel Fair at Pushkar is the largest one of its kind on the planet. Over 50,000 camels find their way to the Pushkar Fair to be traded off or display their best features, beauty and tricks - yes, that's true. Trading of cattle, camel races and dazzling displays of bangles, brassware, clothes, camel saddles and halters make the fair colourful. Necklaces of glass beads from Naguar, pottery, printed textiles from Jodhpur and Ajmer are all on sale here. Farmers, cattle traders and breeders buy and sell their animals, leather whips, saddles etc. There are facilities for camel rides also. This livestock fair coincides with the climaxing of a religious celebration. Pushkar is among the five main places of pilgrimage mentioned in the Hindu scriptures. It has a large number of temples including one of the only two temples dedicated to Lord Brahma in India. Hundreds of thousands of devotees take a ritual dip in the holy Pushkar lake on the day of the Kartik Purnima (full moon night of the Kartika month) and worship at the Brahma temple (Jagat Pita Shri Brahma Mandir). Pilgrims flock from all over India to be in Pushkar at this auspicious time. 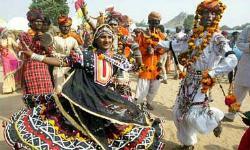 They also believe that all the 330 million Gods and Goddesses are present at Pushkar Lake during the occasion. Apart from the religious rituals and trading, people participate in a number of cultural and sporting events. The sweeping expanse of the desert becomes dotted with thousands of camels, stalls and camping families. The Rajasthan tourism Development Corporation has taken adequate measures to facilitate convenient access of the fair site and to accommodate the fairgoers.